features available for Collections Managers we received last year. now be allowed to create sub-Collections in the Collections they manage. 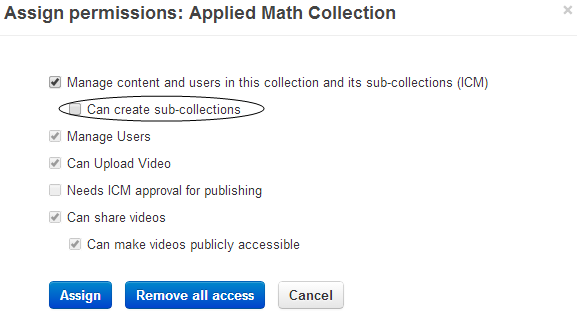 sub-collections and manage all aspects of the created sub-collections as ICM’s. and helpful to administrators while assigning collection properties. updating the support site (http://support.njvid.net) to reflect these changes. NJEDge Update: WOW. What a banner year for NJEDge! The following videos from William Paterson University were added to the NJVID Commons Videos Collection last week. Bear Education and Resource Group. B.E.A.R. The following videos from the NJEDge Faculty Showcase 2012 event were added to the NJVID Commons Videos Collection last week. Online Information Literacy Instruction Goes the Distance in Real Time! Making waves : public access vs. private rights at the Jersey shore.